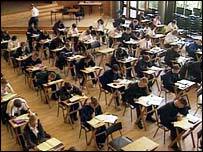 The BBC report that Ministers are to consider whether state school pupils should be allowed to study International GCSEs. IGCSEs involve less coursework and some consider them to be more challenging and better preparation for A-levels than traditional GCSEs. Some private schools already teach them but state schools cannot because they only get funding for approved exams. Schools Minister Lord Adonis said he wanted a debate within the education community on the use of IGCSEs. State schools have been required to teach pupils GCSEs since they replaced O-levels 18 years ago. They are not able to enter their pupils for IGCSEs because they only receive funding for approved exams - and these have not been accredited by the regulator, the Qualifications and Curriculum Authority (QCA). My own school has already switched to IGCSE for Maths and Science. The IGCSE is more rigorous, more demanding, more mathematical - and a better preparation for the current AS/A2 exams. Of course the "dumbing down" of GCSE has led to a recent review of the AS/A2 specification which, unsurprisingly, is taking those papers down to meet the new intake... As a result many independent schools are looking at either International Baccalaureate - or the new Cambridge Pre-U exams. No-one should be too surprised by these moves. It was never going to be possible to expand higher education to absorb 50% of the population without in some way diluting the education of the top 20%. That 20% was hardly going to take these changes lying down. There is some history here as well; the independent sector has led British education for the past 200 years, with initiative after initiative. One of the better examples is the ASE - The Association for Science Education - which can trace its origins back to 1900 with a letter written by four science masters from Eton College proposing a conference for Science Masters in Public Schools. "the attainment of at least some clearer method of the teaching of Natural Science than exists at present, and …. by taking united action, do something towards emphasising the value of Science as a means of education".